Many dog owners tend to share their favorite foods such as chocolate and cookies with their four-legged friends. Once dogs have tasted, they want more. But chocolate is bad for dogs, dog can’t eat chocolate. 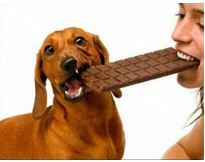 Chocolate is toxic food for dogs, it could cause sickness and even death. Even s little chocolate that weights 40-50g can cause fatal problems with dogs. Chocolate contains theobromine can affect the heart and nervous system of a dog. Dogs don’t easily break down and excrete theobromine. The toxic dose of theobromine is 80-120mg/kg of dog’s weight. Different chocolate contains different amounts of theobromine. In general, to chocolate, the darker the more toxic. Milk chocolate contains 100mg theobromine per 60g chocolate. It means if a little chihuahua eats a big bar of chocolate, it can cause poisoning. Dogs fed toxic doses of chocolate show signs of nervousness, seizures vomiting and diarrhoea within a few hours. With the poisoning degree dog show signs of an increase in the dog’s heart rate, shaking, muscle tremors. There is no specific antidote to theobromine. You need take dog to the vet ASAP.